This week is a fun make that is more aimed at children however adults can get addicted to it to. 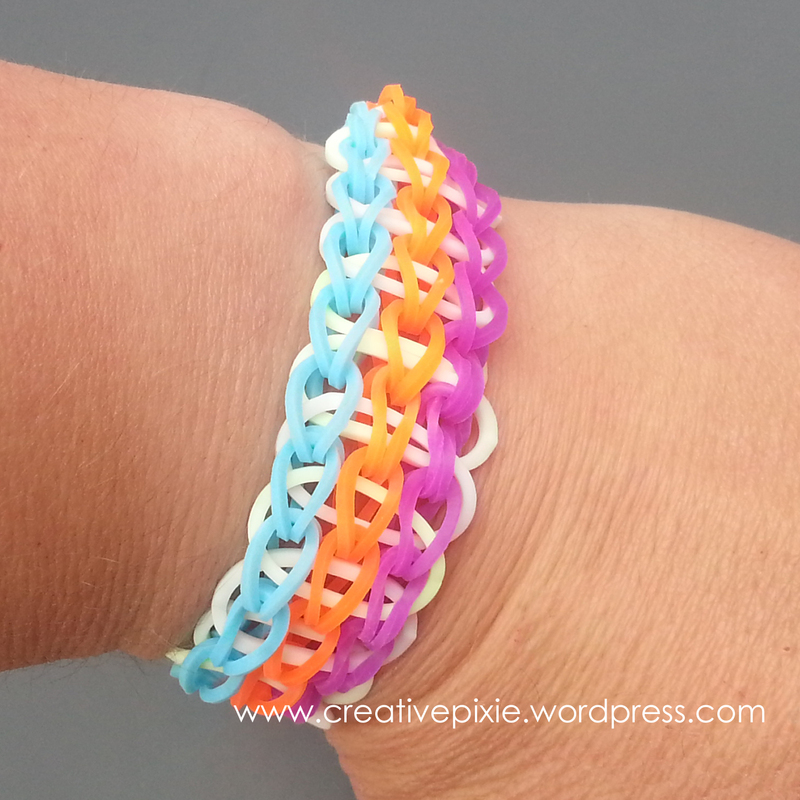 Loom band bracelets are bracelets that are made using tiny rubber bands, a loom peg board, a hook (very like a small crochet hook) and s-clips for joining both ends of the bracelet together. Over the past couple of months Miss P has been coming home from school with these little friendship bracelets that her friends had made for her. So last week when I saw a kit on sale I thought that I’d get it for her so she could have a go herself. Before she could try it out I thought it’d be best if I get my head round it so that I can explain to her how you make them. 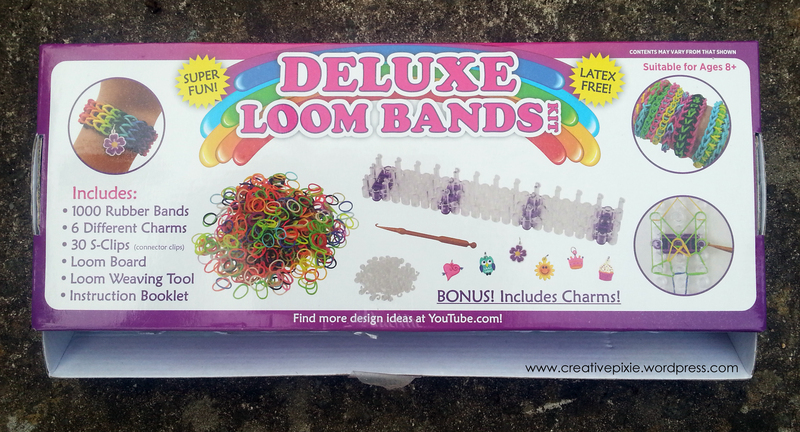 In the end I had to visit my friend Vicki whose boys are really into making the bands so that she could explain it to me and show me the best website for loom band tutorials. Look at all the rubber bands you need, I though 1000 bands in the kit may be overkill but you do use a lot of the same colour if you want a uniform band for just 1 bracelet. 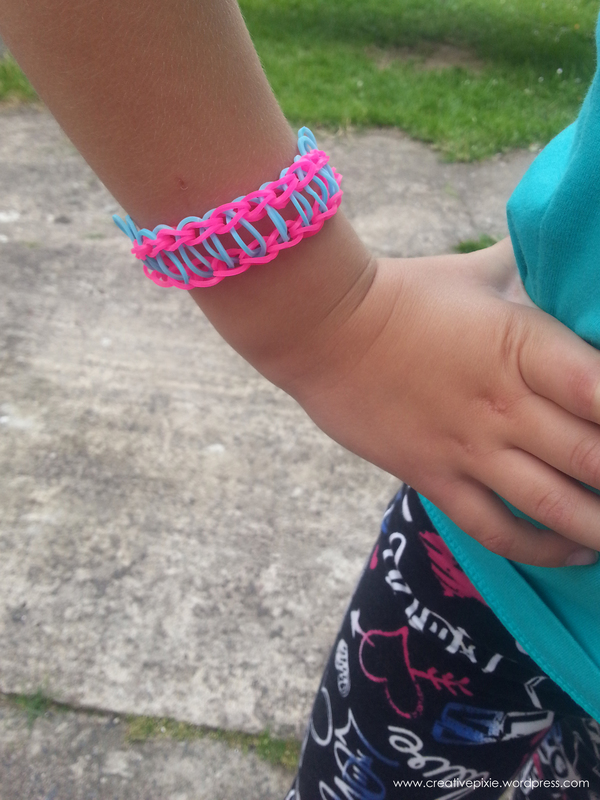 Vicki showed me how to make a ‘Rail Road’ loom band bracelet and the techniques used to extend and join the 2 ends together. As you can see when the bands are removed from the peg board loom it can be quite short so extending chains need added on, charms are optional. 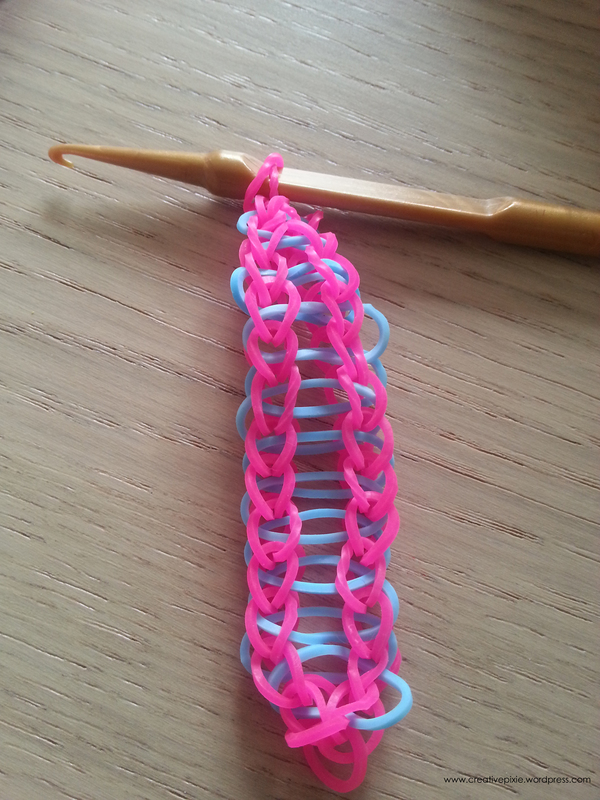 It’s just the right size for Miss P.
After I made this I thought I’d try making one patterns in the kits instruction booklet: the triple single bracelet loom band. Vicki then showed me a site called Loom Love. 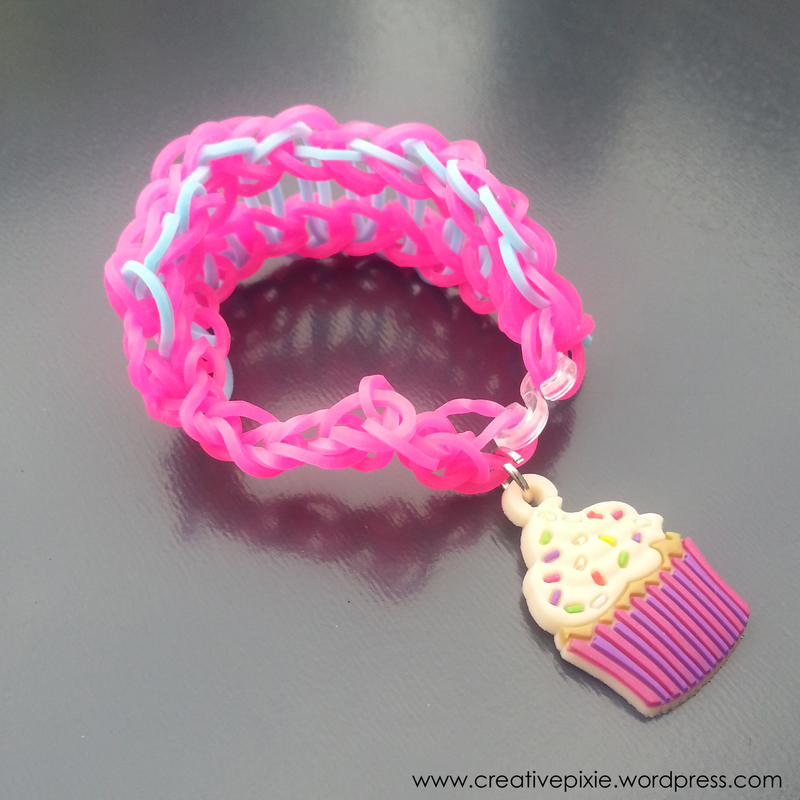 Oh my goodness this website is the amazing when it comes to different loom band tutorials – you must check it out! I saw a pattern called Skittlz which looked lovely so thought I’d try to make it. I didn’t have the 2 looms suggested but thought it was worth making. The pattern was quite tricky, the rubber bands are under a great deal of tension so it can be a bit of a workout removing the bands from the peg board.The finished result was very short so I thought it’d make a nice ring *. * Ignore my horrible hands but look my nails match my ring! I suppose that’s the rest of my week booked up, wonder how many bands ‘we’ can make for her friends before the end of term? How fun and cute. I’ve seen these in the stores, should buy for my daughter(she’s 20). I love your multi-colored fingers with that adorable ring you made!! They are so popular here too! The kids are always bringing them to school. 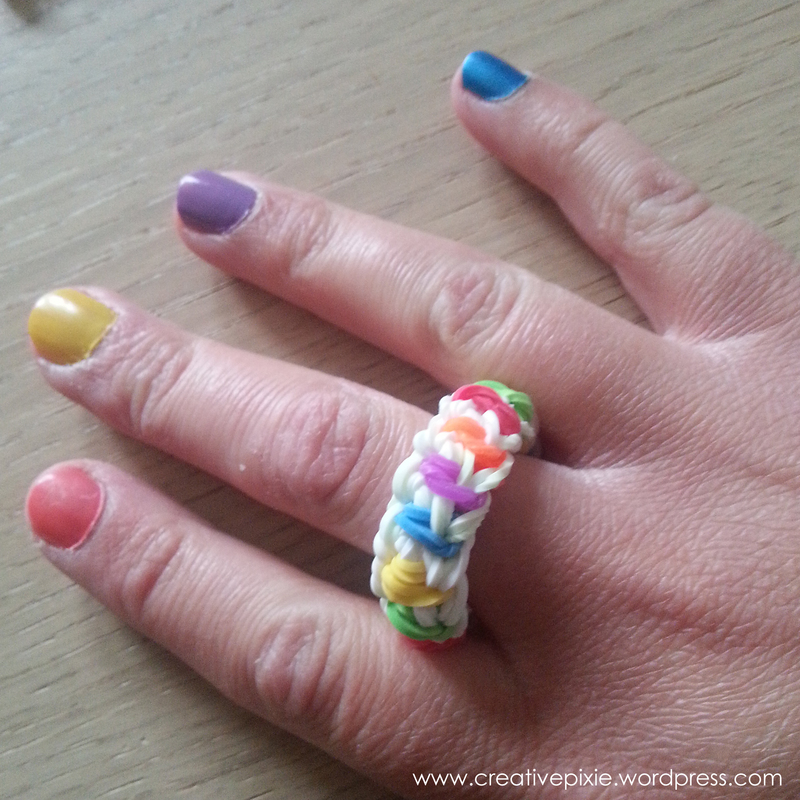 Every week I get given new loom band bracelets, rings and pen toppers the children have made for me. One girl gave me an awesome bracelet with Miss Maggs on it in beads. I enjoy using them, very fun! Ha! I got the exact same set at work last week for my boys. I found Loom Love online too. I got them making single braid bands straight away and they can pretty much do those without help. Big J is asking to learn how to do fishtail ones now. Thought I might write a blog post about it too!! Small world! You should write a post about it, I saw the fishtail ones and they look good. I think I need to buy more bands already, I’ve used up alot of black and white. Coloured transparent bands look very effective in the bracelets. 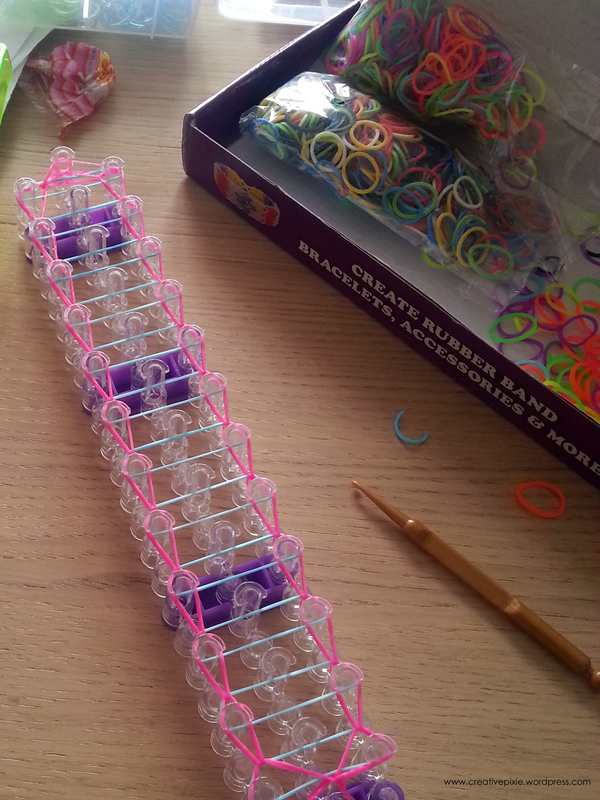 Ah my son loves to loom. Thanks for the link to a looming site. We’ll have to check it out!